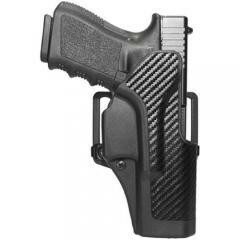 Carbon-Fiber Composite holster with tension adjustable passive retention system. SERPA Technology lock engages trigger guard as pistol is holstered, holds pistol until released. Screw-adjustable detent grabs pistol's trigger guard. Cut down body, tapered trailing edge. Speed cut for fast draw and easy re-holster. Includes both belt loop and paddle platform.